The second model of Farr-Nauta 93' is taking shape on the South African premises of the Southern Wind boatyard; "Thalima" is expected to be launched in Autumn 2004. 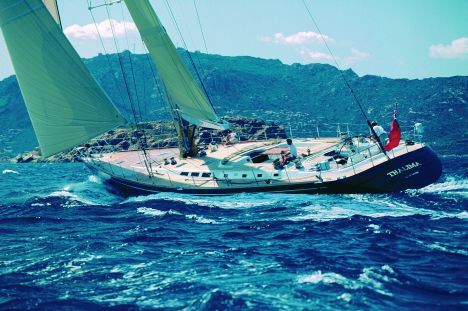 This is a sailing yacht with flush deck and waterlines and sails by Farr Yacht Design, while upper works and exteriors are by the Italian Nauta Yacht Design. "Thalima" has two decks with the lower one including a dinette in the main area, comprising a C-shaped sofa to port and dining table, while to starboard there is an area dedicated to leisure time with double sofas and coffee table. Forward of this we have the owner and guests' sleeping area, made up of an owner's suite and two twin cabins, all with private bathrooms. Astern on the lower deck, which can also be reached from the main deck through a special entrance, there is the crew's sleeping area, with three cabins, of which one is a double with private bathroom. The main deck has been studied to keep clean-cut lines as far as possible, giving the yacht a sporty look and at the same time making crew movements easier during manoeuvres. As usual on boats of this size, the project includes a double cockpit, one in the stern with the wheelhouse and one with cushions for relaxing. Rigging includes a 35.4 m carbon fibre mast by the New Zealand Southern Spars and modern sails with a total surface area of 356 sq/m. A hydraulic sliding gangplank and a hatch have been positioned on the transom; the hatch is also electro-hydraulically operated and when tipped can be used during swimming sessions. Standard motorisation is a Yanmar GLA-STE 350 HP engine, indispensable for days with little wind. For further information please contact the boatyard Southern Wind Shipyard; Reen Avenue-Athlone Industria 1; 7780 Cape Town (Sud Africa); website www.southernwindshipyard.com; e mail info@southernwindshipyard.com, or contact the commercial office Pegaso Yacht Division; via Macaggi 25/21; 16121 Genova (Italia); tel. +39 010 5704035; fax +39 010 5704065; e mail pegasoyd@tin.it.